Why has my veterinarian applied a bandage or splint to my dog? Bandages are mainly used to protect a wound, incision, or injury while it is healing. A bandage protects the wound surface from contamination with dirt or debris from the environment. It may be used to cover a layer of topical medication that was applied to the wound, preventing the medication from being rubbed or licked off. In some cases a bandage is used to hold an injured part against another part of the body, such as bandaging an injured ear to the head, or bandaging an injured or broken toe to the other toes on the foot. Splints are used to provide protection and support to an injured area. They serve the same protective functions as a bandage does, and have the additional benefit of preventing movement of the injured part. If a splint is used to support a fractured bone, it will be applied so that it immobilizes both the joint above and the joint below the fracture. Both bandages and splints protect the underlying tissues from self-trauma such as licking, which will delay healing and may promote infection. What parts of the body can be protected by bandages or splints? 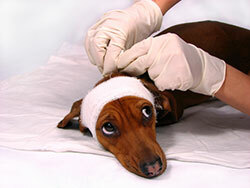 Bandages can be readily applied to the head, neck, chest, tail or lower legs of a dog. Splints are usually applied below the knee on the back leg or below the midpoint of the humerus (the bone that connects the shoulder to the elbow) on the front leg. The anatomy of the upper part of the front and back legs makes it very difficult to apply a bandage or splint that will stay in place without slipping or causing irritation to the surrounding tissues. If it is necessary to protect or stabilize these areas, your veterinarian will apply some type of immobilizing sling. Why are there so many layers to the bandage? "...small bandages such as we use to protect our own wounds do not work very well on animals." Probably the most important thing to realize about bandages is that small bandages such as we use to protect our own wounds do not work very well on animals. The dog's haircoat prevents an adhesive bandage from sticking well to the skin, and a small bandage is easy for the dog to pull off. As a rule, dogs don't like anything that is stuck to their hair or skin and will usually try to take it off. Therefore, protective bandages that are applied to dogs will always be made up of several layers of bandage material, and whenever possible they will wrap entirely around the body part that is being protected. The first layer of bandage material will be a dressing layer of some sort. If the purpose of the bandage is to protect a surgical incision or a non-infected wound, the dressing layer will be made of a material that will not stick to the wound such as a non-adherent gauze pad. If the wound is infected, the dressing layer will be made of a sterile material that will stick to the wound and help draw out the infection, or will contain a medication or other agent that will assist in controlling the infection. The purpose of the next layer of bandaging material is to help keep the dressing in place, and to provide some padding to the area to be protected. It will either be rolled gauze material or cotton or synthetic cast padding. The thickness of this layer will vary according to the type of injury. The third layer of material is usually made of a stretchy material that sticks to itself without adhesive. The purpose of this tougher layer of material is to provide further protection to the underlying layers and to help prevent moisture from wicking through to the wound. The final layer of bandage material will often be surgical tape, a strong adhesive material that tapes down the ends of the bandage and adheres to the fur so that it is difficult for the dog to remove the bandage. How does a splint differ from a bandage? A splint incorporates some sort of hard or rigid material within the bandage so that the area beneath the splint is immobilized. Splints may be metal, plastic, or wood, and may be straight or curved to the shape of the limb. After protecting the surface of the injured area with a dressing and some padding, your veterinarian will securely place the splint over the area to be protected and will apply more layers of bandage material. The thickness of the padding layer, and thus the size of the splint, will depend on the location and type of injury. How often does the bandage or splint need to be changed? If the wound beneath the bandage is infected, the bandage will need to be changed as often as twice per day for the first few days, until the infection is under control. Since the purpose of a splint is to help immobilize an injured body part, it is usually changed less frequently. In puppies that are growing rapidly, the splint may need to be changed weekly to allow it to be adjusted for proper fit. In adult dogs, a splint may be left in place for several weeks if there are no complications. Your veterinarian will tell you how often the bandage or splint on your pet will need to be changed, depending on the specifics of the case. How do I care for the bandage or splint? "General bandage and splint care includes keeping the bandage clean and dry, checking that the bandage does not slip or become too tight, and checking for any discharges or foul smell." General bandage and splint care includes keeping the bandage clean and dry, checking that the bandage does not slip or become too tight, and checking for any discharges or foul smell. Check the bandage at least twice daily to ensure that it is clean and dry and that it is neither too tight nor too loose. If the toes are exposed below the bandage, check that they are free of discharges or bad smells, that they are neither hot nor cold, and that they have not become swollen or red. Any of these signs could indicate that the bandage is too tight or that the infection is spreading. For the same reasons, also check the area above the bandage to make sure that it is not swollen, red, chafed, or otherwise irritated. Finally, make sure that the bandage has not slipped up or down. Do not allow your dog to lick or chew at the bandage. 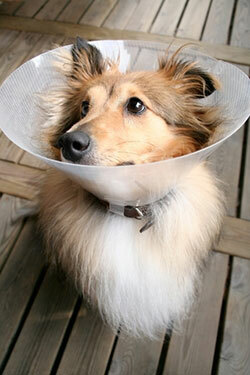 If your dog continues to bother the bandage, it may be necessary to use an Elizabethan collar to prevent access to it. Do not take off the splint or bandage unless specifically instructed to do so by your veterinarian. If your dog takes off the bandage on its own, you should contact the veterinary clinic immediately and make arrangements to bring the dog in for a recheck appointment. If your dog left the bandage alone when it was first applied and then suddenly began to chew at it, it may be an indication that a problem is developing. If this happens, do not delay - contact your veterinarian immediately for further advice. Restrict your dog's exercise and don't allow the bandage or splint to get wet. When you take your dog outdoors for bathroom breaks, cover the bandage with a plastic bag or a protective bootie to prevent it from getting wet or soiled. "Without exception, your dog must not be allowed to go outside unless leashed and directly supervised by a responsible adult." Without exception, your dog must not be allowed to go outside unless leashed and directly supervised by a responsible adult. Your veterinarian may recommend confining your dog to a crate or cage to restrict its activity. When should I take my dog back to the veterinarian?